Panel on the building with image from the installation Assemblance (2014) by Umbrellium showing a man embracing laser beams. 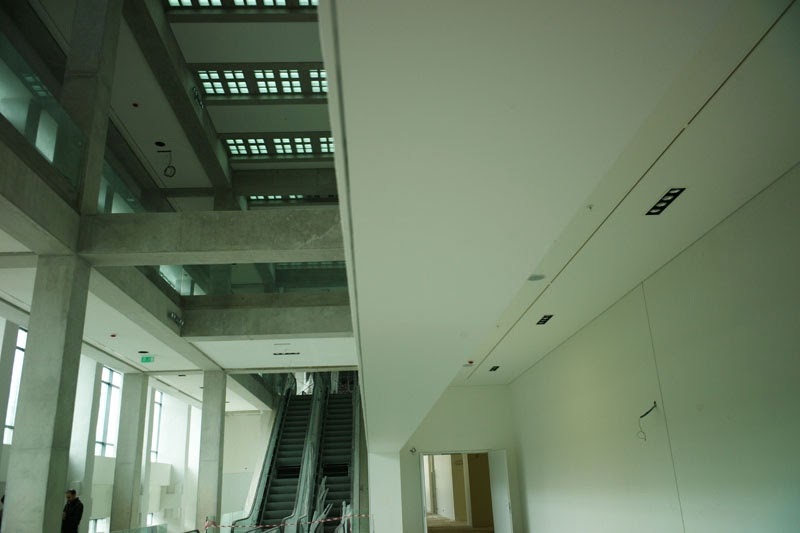 (The National Museum of Contemporary Art is located on the same road axis a 15min walk away. The SNFCC is also on the same road axis further away on this direction towards the sea). Excerpt from above link: "From Pac-Man, Super Mario and Tetris to Gravity and Inception, from Björk to will.i.am from the Back Eyed Peas, from Steve Jobs and Steve Wozniak to Augmented Reality and from the Industrial Revolution to 3D printing, the "Digital Revolution" exhibition showcases the impact of digital technology on the evolution of the Arts, design, music, fashion, film and video games. The future is here and it's made out of algorithms and pixels." Comment: This specific panel of the installation is an amazing experience; your stand infront of a surface and your arms are shown as wings. If you can move them quickly up and down, you manage to fly, to lift off the ground! Sound is heard as you move your wings. Here is a video from a visitor. 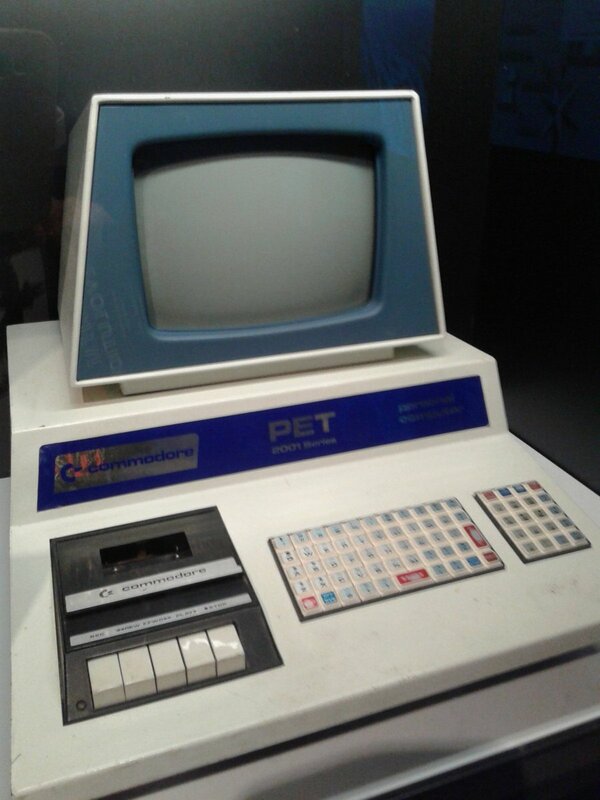 Digital Archaeology celebrates digital creativity across the areas of art, design, film, music and videogames and highlights the dramatic pace of technological change (1970-2000). In 1975, Ed Roberts of Micro Instrumentation Telemetry Systems (MITS) decided to create a home assembly kit for a computer. Before he had a working version*, Popular Electronics published a picture of the empty case in its front cover. An ad in the magazine marketed “The Altair”, named after a planet on Star Trek for $397. Roberts hired two Harvard students to adapt the BASIC programming language for the Altair; those students were Paul Allen and Bill Gates. Six weeks later they had created Altair BASIC. This spark would light the digital revolution. Link. 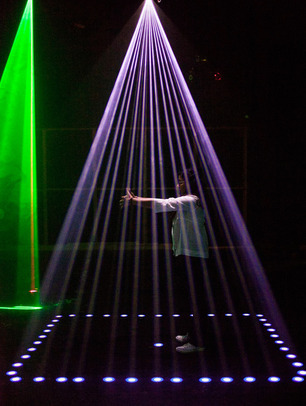 You interact with the lasers. You can swing them back and forth, encircle them/embrace them to focus them (as shown at the advertisment on the building at the first image) etc. English transcript of the 30' video: "We were gathered on a specific day on a specific place. We were gathered to build together something. Not something that will last; because what lasts... But something seen simultaneously by many eyes." At the end of the video a pendulum made by an electric guitar that generates sound periodically is presented. Excerpt from above link: "The production brings together society—the ‘big house’ in which we all live—and the ‘other’ home which society provides for vulnerable social groups, as well as the hopes, dreams, fears and expectations of En Dynamei’s members." "The Onassis Cultural Centre in collaboration with the Europeana Space Network, invites designers, artists, publishers, programmers, authors, poets, hackers and entrepreneurs to a marathon which will redefine the book. The marathon will revolve around programming, design and entrepreneurial innovation." Personal thoughts: A different mentor on a pathfinder mission of knowledge transmission/messaging. As the president of the French Investment bank (BPIFrance), N. Dufourq, mentioned in an interview all society actors need to be on Twitter in order to enable public dialogue.